Poor, poor Wii gamers. There's much to love about Nintendo's system, but when it comes to multi-console franchises, the Wii just falls short (with a few notable exceptions). The fabled Call of Duty: Modern Warfare is headed to the Wii this fall, and it will be quite different from its brothers on more powerful consoles. 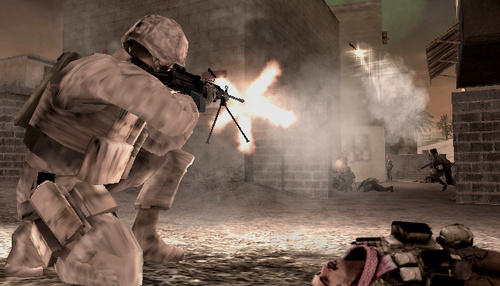 All is not lost, however; there will be co-op in Modern Warfare, which was lacking from the PS3 and Xbox 360 versions. Great news, right? Not so much. It appears the co-op being added is pretty much the same was we got in Call of Duty: World at War for the Wii last holiday season. A second player can join in any time throughout the campaign (good), but only controls a targeting reticle and an ammo bar (bad). We found this "co-op" in World at War very disappointing, to put it mildly, in our review. This kind of co-op is really best left to kid's games or situations where split-screen would be impossible. I wonder: is bad co-op better than no co-op at all? Page created in 1.2813 seconds.